Texas Rangers Cards: Rangers roster begins off-season change. The Rangers have begun their off-season moves. J.P. Arencibia and Kevin Kouzmanoff already took their free agency rather than start 2015 in the minors. Alex Rios won't be with the team in 2015 either it doesn't look like. Texas announced on Wednesday morning that they won't be picking up Rios' $14 million option for the 2015 season. Instead the team opted to buy him out for one million and send him on his way as a free agent. As I mentioned in my 2014 season review, this move really doesn't surprise me. Chalk one up for my prediction skills I guess. Alex didn't have a bad year in 2014, he just didn't have a really good one either. The Rangers figure they can get a decent year from one of their young outfielders at a fraction of the price Rios would have cost. 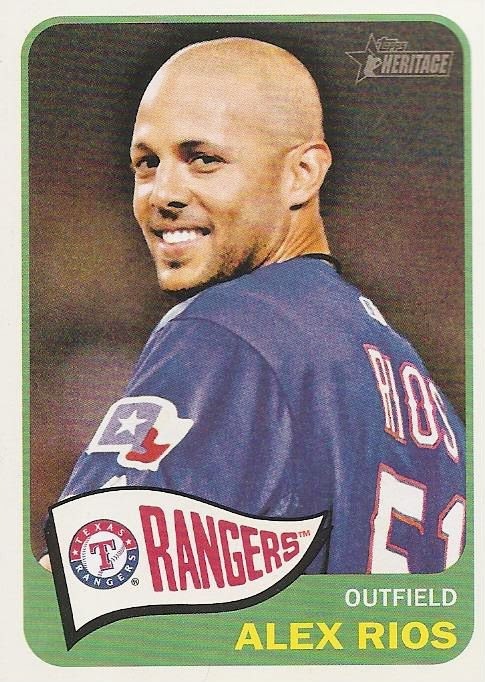 What will be interesting now is how much Rios, seen here on card 85 of the 2014 Topps Heritage set, will get on the free market. Right now the plan calls for Shin-Soo Choo to move from left to right field to replace Rios. Barring a trade or free agent signing, that will leave Michael Choice, Jake Smolinski, Daniel Robertson, Ryan Rua, and Jim Adduci duking it out for the left field spot. The runner-up will likely end up as the fourth outfielder. There are some big name free agent outfielders on the market. Melky Cabrera, Nick Markakis, Torii Hunter, Nori Aoki, and former Ranger Nelson Cruz. Since Texas is going to be looking to shore up the pitching staff I really don't look for them to make a play for any of these guys. If they do, Aoki would probably be the only one they would seriously look at. The Rios move frees up some cash for a possible pitcher signing. I like that. It does take an experienced bat out of the lineup though so it's a bit of a gamble. It's probably the right move though. Texas has a lot of hungry young outfielders right now and can afford to bet at least one of them comes through to replace Alex. Speaking of replacements, the Rangers announced the replacement for manager Ron Washington yesterday. Like many, I expected bench coach/interim manager Tim Bogar to get the nod. Instead the club went with Pirates bench coach Jeff Bannister. From the outside it seems that Bannister must have really wowed the front office to get the nod over Bogar. Hopefully he can wow the players and fans as well in 2015 and beyond.